A. The definition of factoring is quite simple; it is the sale of invoices at a discount. Q. Is factoring a new financial service? A. No. Factoring or accounts receivable financing, traces its roots to biblical times and is secured short-term financing. It is the purchasing of commercial paper, invoices, receivables, trade acceptances and contract rights. Q. What types of businesses use factoring? A. Companies of all sizes, from sole entrepreneurs to Fortune 500 corporations, use factoring as a way to increase their cash flow. Factoring can benefit companies in all stages of the business life cycle, from start-ups to mature companies. Q. What industries typically use factoring? A. Clients come to us from a wide range of industries. We do not purchase third party healthcare receivables and invoices for fine jewelry. Q. What is the difference between a client and a customer? A. A client is the company that signs the contract with the factor and provides the goods or services. A customer, or account debtor, is the company that buys goods or services from the client. Q. What is the difference between recourse and non-recourse factoring? A. With recourse factoring, a client sells invoices to a factor, with the promise to buy back any uncollected invoices. This means the client ultimately takes the responsibility for the payment of the invoice. Non-recourse factoring allows companies to sell their invoices to a factor, which assumes all of the credit risks for the collection of the invoice. Prestige primarily offers non-recourse factoring. Q. How does factoring work? Q. What are Prestige Capital’s requirements? A. Simply that our clients provide goods or services to creditworthy customers, and we can verify that the invoices being submitted for purchase are valid. Our approval decisions are based on the creditworthiness of the client’s debtors and not on the financial strength of our client. Learn more about factoring. Q. What is the professional experience of Prestige Capital’s management? A. Our principals have over 100 years of combined experience providing funds to hundreds of companies throughout the United States. We understand that each client has unique financing requirements and faces distinct challenges. We work hard to provide businesses with flexible financial solutions that best meet their needs. We work as one team; bringing together people from a broad range of backgrounds whose different perspectives enable us to provide highly customized financing for simple to complex transactions. Learn more about Our Team. Q. Are there any geographical restrictions as to where your clients are located? A. No. We have clients located throughout the contiguous United States, Canada and Puerto Rico. Q. Do you require certified financial statements to be considered for factoring? A. No, we do not require financial statements. Our approval decisions are based on the creditworthiness of the customer and not on the financial strength of our client. Q. Does a company have to be operating profitably for Prestige Capital to factor their receivables? A. No. Many of our clients are in the very early stages of growth and have not yet turned a profit, or no longer qualify for traditional bank financing due to financial or operational issues. Q. How do we get started with Prestige Capital? A. Complete our Application or contact one of our sales directors for more information. Q. What volume of sales does my company need to generate to be considered by Prestige Capital? A. If you intend to factor over $100,000 per month of your sales, we can help. We have the ability to factor up to $10 million per month in receivables to any one client. Q. How long does the closing process take? A. 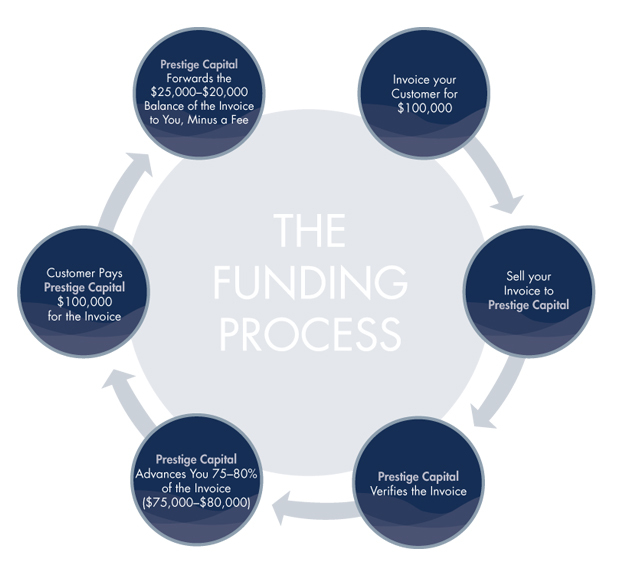 The entire underwriting and funding process typically takes 5-7 business days. The initial funding generally takes 24-72 hours after execution of the purchase and sales agreement . Q. Does Prestige Capital require personal guarantees? A. We do not require traditional personal guarantees as we assume the credit risk on factored invoices. However, if the invoices are not bona fide and valid, the principals may be responsible for damages suffered by Prestige Capital. This is commonly referred to as a validity agreement. Q. How is Prestige Capital different from other factors? A. The implementation of factoring by the hundreds of factors throughout the U.S. is quite different and complex. Some factors specialize in select industries, while other factors work with clients across a wide range of industries. It is important for clients to understand the full breadth of products offered by a factor along with their collection process and fees. We pride ourselves on being simple, fast, straightforward and flexible. Q. What does Factoring cost?